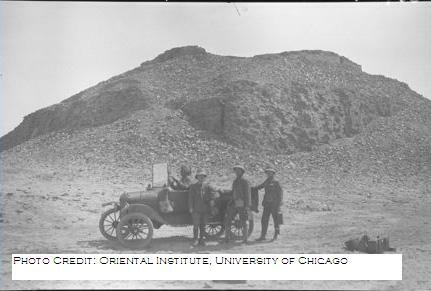 "American Archaeologists in the Middle East, 1919-1920 ....traces the travels of our founder, James Henry Breasted, through Mesopotamia and Syria. 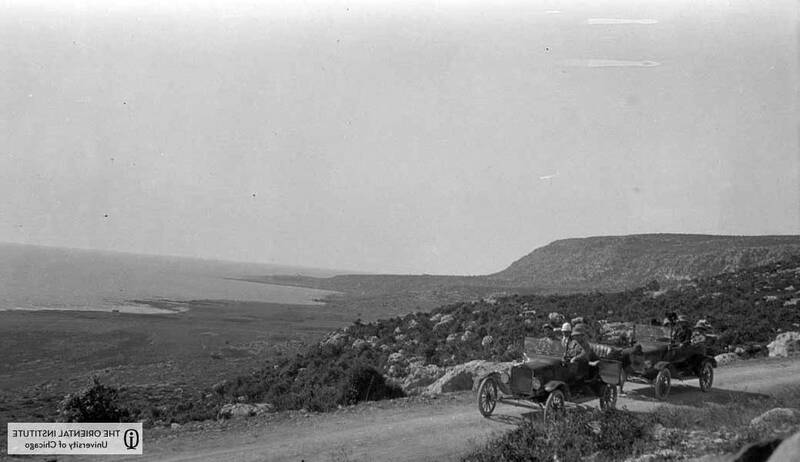 Much of the daring trip was done in Model Ts supplied to Breasted by the British army." You can see the right hand drive in the lead car. But beyond that I don't want to hazard a guess at the model years. A higher resolution photo of just the cars would make it easier to see things. You might want to ask the folks for one � it they want a more accurate date. But all the ones I can see have the steel radiator and the curved front fenders so they would be a 1917 or later model year vehicles. For England production that would mean the middle of 1917 or later [ref page 119 �The English Model T Ford�] (I would need to check more about Canadian production). So if it is an English Model T it would have been produced sometime between Summer 1917 � 1923 or so. From what I can see all of them are on a car chassis and not the Ton Truck chassis. Note both the Ford of England and Ford of Canada (also Ford USA but I don�t know about in the teens but for sure early production they did) produced right hand drive models. If they know when the expedition started then they already have access to the latest the cars could be. But if you can provide a higher resolution photo we may be able to see if the car has the wishbone above the axle (1918 or earlier) or below the axle that started in 1919 for USA production. Feel free to click on my name, my profile will come up and my e-mail address is the third line down. I will gladly take a look at the photo as well as post the cropped zoomed in view. For an example of how helpful that can be see: http://www.mtfca.com/discus/messages/80257/116286.html where we zoomed in to clarify some of the details. Note in that Washington DC 1919 picture all the Model T�s shown have the old style wishbone above the axle. Thanks, Hap, I sent you an email with some other photos, too. I also have requested some higher resolution scans. They're calling their exhibit 1919-1920, so I guess we can exclude model years after that. 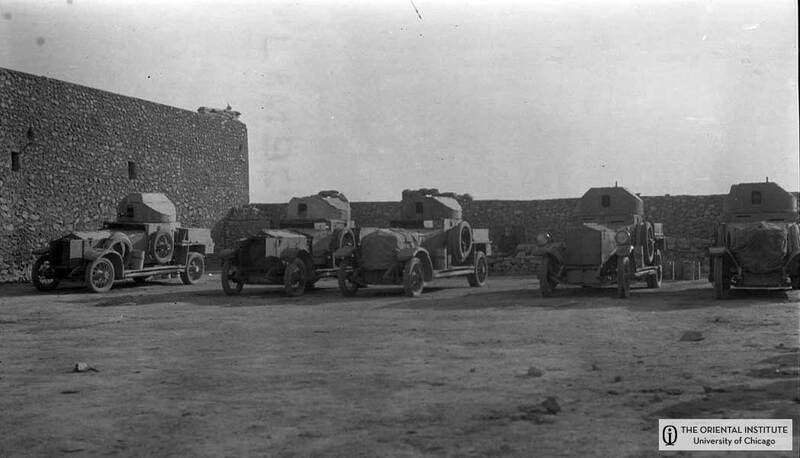 The larger cars in the second photo appear to be the Rolls-Royce armored cars. That is not an area I do a lot of research on � but from visiting WWI sites � looking for Ts I have seen similar armored cars and I believe they were Rolls-Royce. Thank you for e-mailing me the photos. All of them were less than 100kb. The original pictures may not be that clear � but if they had a high resolution scan 800kb or greater of the car � not the background picture � it would make dating from the details much easier. Great history � thank you for posting them. The armored cars looks like something you sit in when your mother in law comes to visit. 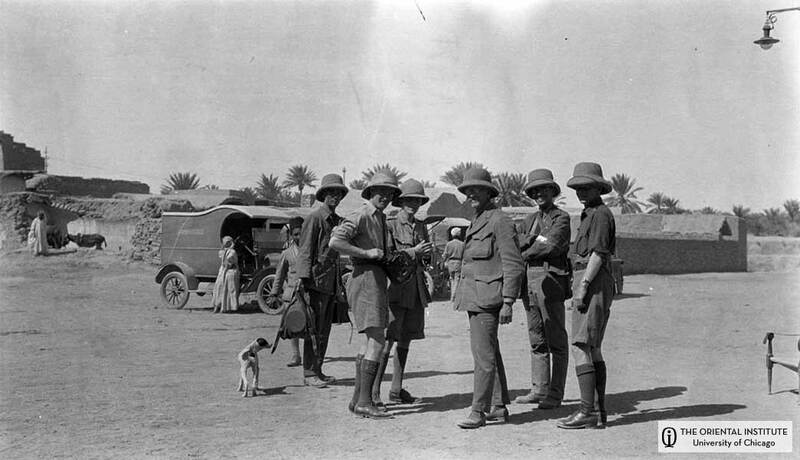 Take a look for information on Lawrence of Arabia. I believe he used Rolls-Royce armoured cars and Model Ts for support. Perhaps that fleet of vehicles is where these vehicles came from. Or should they be RHD as shown below when the photo is flipped? Again, if you have the chance please request higher resolution scans of the cars (I don�t need the background for dating). Note if the cars were RHD -- then at idle the left hand lever for gas would be up for idle while the spark on the right side would be down. Just the opposite of the LHD cars. The photo of the six fellows with the dog suggests that the photo is flipped the correct way and the C Cab panel is a RHD. Shirts and jackets are buttoned left panel over right which is correct and the fellow with the watch is probably right handed. Thanks for the suggestion about looking at the clothes � I had not thought about that one. I usually just look at the cars and with the exception of lettering (it should read correctly) I don�t usually look very long at the non-mechanical items in the photo. I agree with you that the photo with the men with the black radiator English C-cab and dog above is Right Hand Drive (RHD). I hadn�t really thought that it might have been reversed and been a LHD. I would like to be able to see a clearer image of the initial photo showing the numerous Model Ts. I think a better copy might show that it contains English Model Ts that show RHD cars produced before Oct 1919 and �possibly� LHD cars produced after Oct 1919. Again � a plea for a higher resolution photo. It still may not be possible to see the location of the steering wheel on the other cars � but it would increase the chance of seeing the steering wheel. And if the image above was a little better (or my eyesight a little better) perhaps we could tell which way the coats are buttoned in those photos or see some other clues? If the two tourings shown above are LHD cars they would most likely would have been English produced cars rather than USA or Canadian produced cars if they were provided by the British Army. And if they were English cars and LHD they would have been produced after Oct 1919. 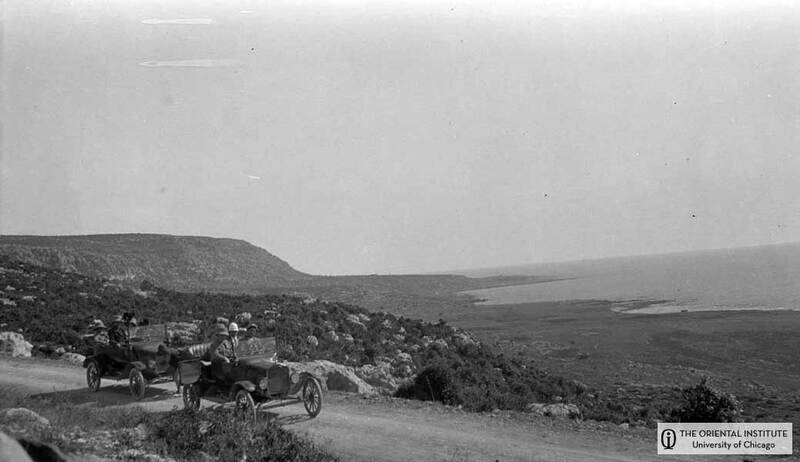 Which would date that photo after Oct 1919 and probably after Nov 1919 � it would take a little while to get the car to the Middle East. Again, thank you Ken for confirming the C-cab was a right hand drive model. Thanks, Hap. I have put a request in for higher resolution of the cars only. Am awaiting a response. I'm off to mow the leaves in the yard. But if you click on my name, my e-mail address is on the third line of my profile. You can e-mail me any photos, I'll gladly resize them and post them. The larger size / higher resolution often give us the additional clues we need / want to see.